I bake and post what I am craving at the moment. Some days it’s a soft, chewy bar or cookie. Frequently it involves colored sugar or sprinkles. Rarely do I bake crispy crunchy. Not because I don’t crave crispy crunchy. Rule number one for care package recipes is to pick sturdy cookies. 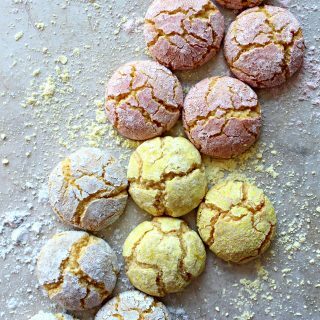 Crispy cookies are notoriously delicate and bound to crumble in transit. 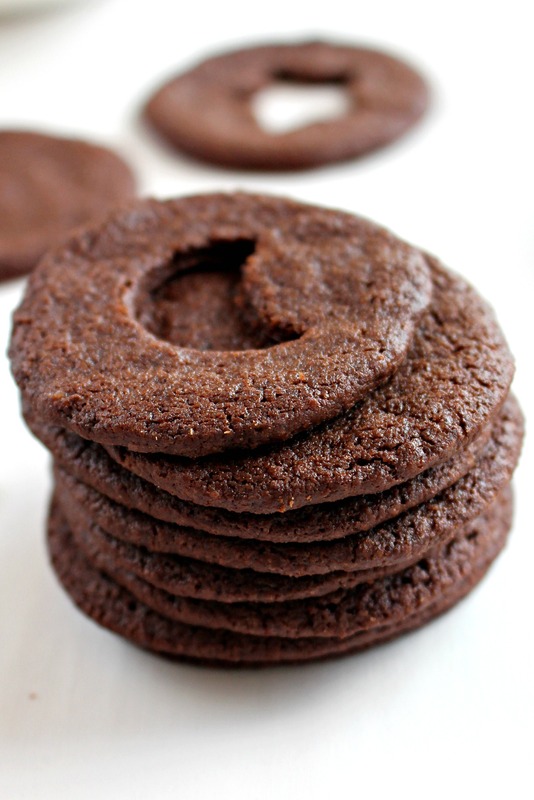 That would be true for these slice-and-bake chocolate wafers too, until melted chocolate transforms them. When the crunchy cookies are sandwiched with luscious, creamy chocolate mint centers, they turn into crispy yet sturdy sandwich cookies with wanderlust. Before we talk cookies I want to talk adjectives. Specifically, the word “crunchy”. I love language. Not surprisingly, I spend a tremendous amount of time reading food blogs. What may surprise you, based on the content of The Monday Box, is that many of the food blogs I follow specialize in vegetarian, “healthy” recipes. After all, life is about balance. Through all of this health food reading, I became familiar, and then accustomed to, “crunchy” taking on a meaning beyond Webster’s definition of crisp or brittle. According to Urban Dictionary (my son is now cringing at the thought that his aged mother even knows that Urban Dictionary exists) “crunchy” can now mean health-conscious and environmentally aware. When I used “crunchy” that way in a conversation with my above mentioned 20-something son and his girlfriend, neither had any idea what I was talking about. Either they don’t hang out with health conscious environmentalists or score one for Trendy Mom. I will take the score. This has nothing at all to do with Crunchy Chocolate Mint Sandwich Cookies, which are crunchy only in the traditional sense, but I now smile every time I use the word “crunchy”. I so rarely know anything before my kids, that I just had to gloat a bit. On to cookies. 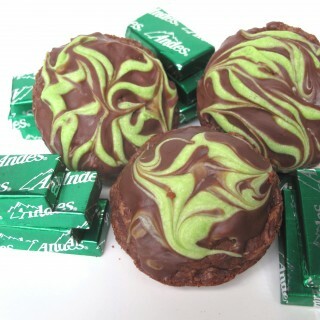 Chocolate mint is an especially popular flavor combo from Christmas through St. Patrick’s Day. Those holidays, plus annual Girl Scout cookie mania, serve to remind us that chocolate and mint are meant for each other. 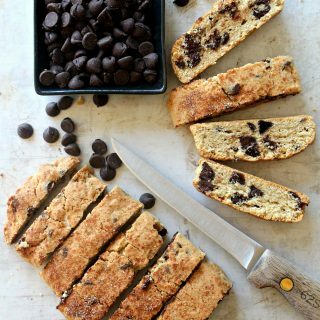 The crisp chocolate cookie in this recipe is much like the chocolate wafers that are crumbled to make pie crusts. They are THAT crisp and chocolaty. They make a crunch sound when you bite them. They are delicious on their own, just not practical for mailing. Chocolate-mint filling makes Crunchy Chocolate Mint Sandwich Cookies sturdy enough for care packages and upgrades this simple chocolate wafer with the addition of mint. The cookies are super easy to make. The dough is formed into a log, chilled, then thinly sliced for baking. Immediately after removing the cookies from the oven, a cut-out of any shape is made at the center of half of the cookies. Melted chocolate is combined with a few drops of peppermint oil for the filling. It is important to note that peppermint oil and peppermint extract are NOT the same thing. Peppermint extract has added water and alcohol which would cause melted chocolate to seize, becoming thick and unspreadable. 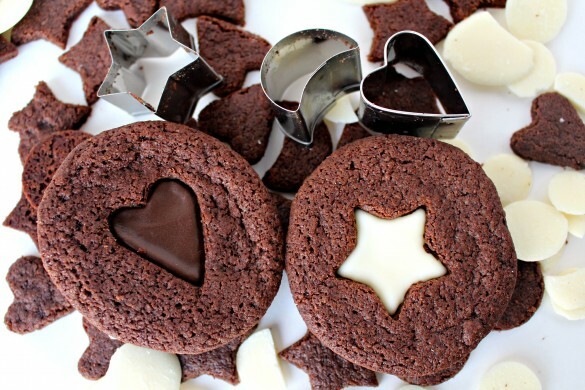 The filling is spread on a cookie without a cut-out, then topped with a cookie with a cut-out, allowing the chocolate filling to show through. White, milk, or dark chocolate can be used depending on your preference. I used half white chocolate and half dark chocolate. 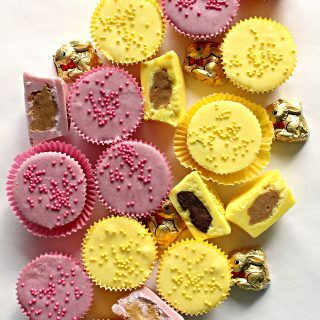 For ease of melting and spreading, and for rich, creamy flavor, I use Bada Bing Bada Boom Candy and Molding chocolate from Chocoley.com. 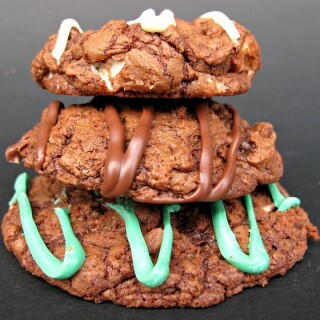 There are many good reasons to bake Crunchy Chocolate Mint Sandwich Cookies. They are delicious to eat and so pretty to look at. They l happily take care of crunch cravings. They ship well and stay fresh for up to 2 weeks. And should you want to score points in the language trends department, serving Crunchy Chocolate Mint Sandwich Cookies could be a conversation starter! In a food processor pulse together flour, cocoa, sugar, salt, and baking soda. Add the butter and pulse a few times. In a small bowl, combine the milk and vanilla. Then add to the processor bowl and run until a dough forms. Turn the dough out into a mixing bowl and knead a few times to fully incorporate all of the ingredients. On a sheet of wax paper, form the dough into a log about 14” long. Wrap the log in wax paper and refrigerate until firm, about 1 hour. When ready to bake: Preheat the oven to 350° F. Line 2 baking sheets with parchment paper. Slice the dough log into thin slices, 6 slices per inch. The dough should slice easily without crumbling or losing its shape. If the slices crumble, allow the dough to warm slightly. If the dough loses its shape, return it to the refrigerator to firm. Place the dough slices at least 1” apart on the prepared baking sheet. Bake for about 7 ½ minutes. The cookies will puff up slightly while baking then deflate after about 6 minutes. They are done 1 ½ minutes after they deflate. 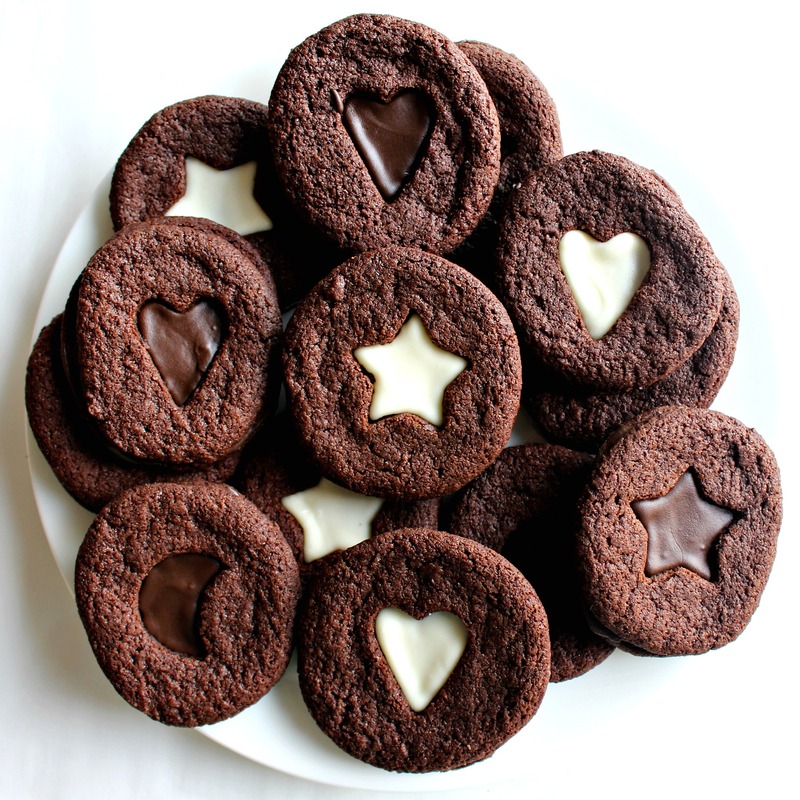 Immediately after the cookies are removed from the oven, use a 7/8” cookie cutter in the center of half of the cookies. If the cutout does not come out with the cookie cutter, wait until the cookie has cooled to remove it. Repeat the baking and making center cut-outs with the second baking sheet. Turn an uncut cookie bottom up. Spread ½ -1 teaspoon of the chocolate onto the cookie, then place a cookie with a cut-out on top of the melted mint chocolate. Repeat with all of the cookies. Allow the chocolate to set completely (about 20 minutes) before storing in an airtight container at room temperature for up to 2 weeks. Double wrap pairs of cookies, bottoms together, in plastic wrap. Pack snuggly in columns in freezer weight zip lock bags or airtight storage containers. Craving more chocolate mint treats? Click on the photo for the recipe! These are just wonderful Wendy! So creative and I love the way they give you a peek inside. Very cute and I am sure they are tasty! The older I get the more I love the fresh vegetarian recipes and like you – I like to blog about something a little special – lots of balance – but sometimes I get on the wrong end of the scale 🙂 Have a great weekend! Thanks, Tricia! I was so pleased to find a way to mail crisp, crunchy cookies. The chocolate mint flavor made me happy too. 🙂 I try to find a balance in our eating and “save up” for splurges that make me happy. 🙂 I hope you have a great weekend, too! And these cookies sound completely delicious – it’s been ages since I’ve used the chocolate mint combo in baking. 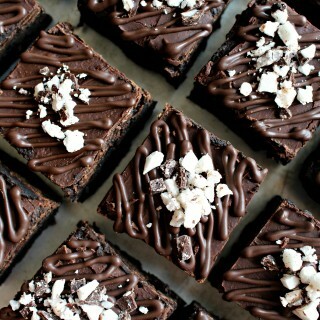 I need to make these and make up for lost time!! 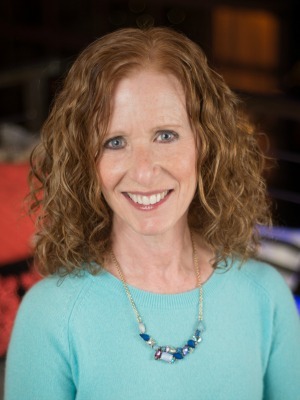 Hope you’re having a great week Wendy!! So many of my favorite “crunchy” (as in healthy, vegetarian, amazingly delicious) recipes come from you, Ashley! 🙂 Chocolate mint is a favorite flavor in so many kinds of desserts…candy, cookies, ice cream. So many choices! Enjoy. We think alike, Wendy. I just posted a chocolate and mint dessert recipe too! 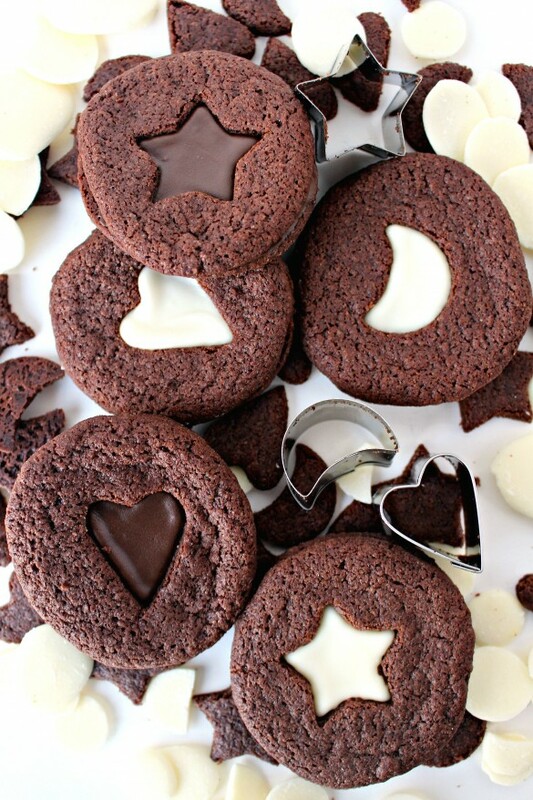 These cookies look cute and amazing! Everyone would love to receive these in the mail. Have a great weekend! Your Mason Jar Thin Mints Icebox Cakes look DELICIOUS, Lokness! One can never have enough chocolate-mint! I hope you have a great weekend, too! Thanks! I want to eat these so much, Wendy. I think that’s the overwhelming thought I get as I read this! 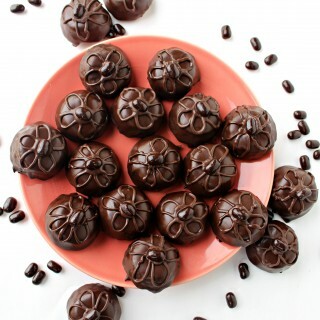 I think chocolate & orange might be my very favorite combo but mint-chocolate is right there vying for the top spot. 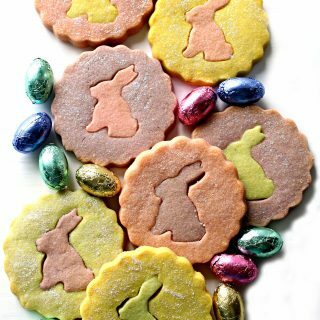 : ) My son loves loves it and I know he’d enjoy these wonderful cookies. Hope all is well! Thanks, Monica! Oooo, I think using a couple of drops of orange flavoring oil in the dark chocolate would be delicious! 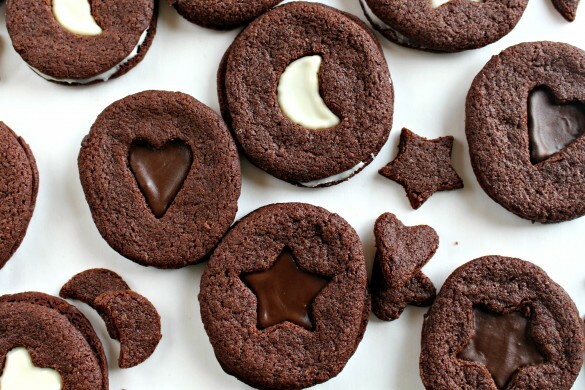 The cookies are just chocolate, so the filling can be flavored any way you like….or not at all! 🙂 With one batch it would be pretty easy to make some for you and some for your son. You both could decide whether or not to share with your husband! 😉 Have a great weekend! You come up with such fun and pretty cookies Wendy. And chocolate mint is my favorite flavor combination .Win-win-win! What pretty cookies! I wish I had some with my coffee right now! Thanks for sharing at Throwback Thursday. Thanks, Carlee! These are great with coffee. So very clever! I loved learning about how to do the cutouts! My son told me the other day that my blog was a strange combo of hip and nerd…*g* I’m just glad he reads it! 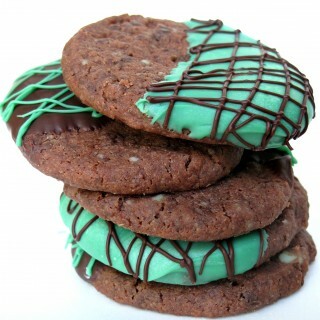 We will just love your Crunch Chocolate Mint Sandwich Cookies, they look awesome! Thanks so much for sharing with Full Plate Thursday and come back soon! 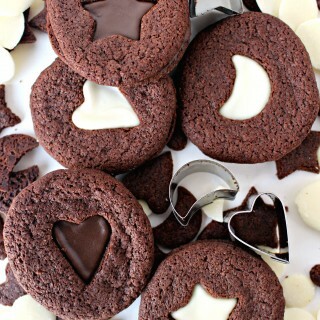 These cookies look soooo beautiful!! I love the shape 🙂 I’ll tell you a secret – I’ve never baked anything with mint flavor before. I do have peppermint flavor though and peppermint oil….